At Treasure Coast Window Fashions here in West Palm Beach, we know that our customers like a good value. So we’re happy to pass along any info about savings from Hunter Douglas—including notification about the current rebates promotion, which is going on now through June 25. If you’re thinking of getting new window fashions for your home, contact one of our trained consultants today. 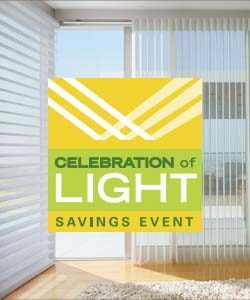 Receive a rebate of $100 when you purchase one Luminette® Privacy Sheer (plus another $100 rebate for each additional unit) or two Silhouette® Window Shadings (plus another $50 rebate for each additional unit). 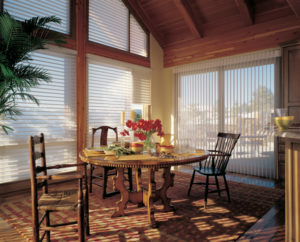 The offer excludes HDOrigins™ and Nantucket™ Window Shadings, a collection of Silhouette® Window Shadings. Your rebate will come in the form of a prepaid reward card—Hunter Douglas will mail it to you within 4 weeks receiving your receipt and rebate form. Some restrictions apply, so be sure to speak with a representative for full details. Now is the time to explore the possibility of Hunter Douglas Luminette® Privacy Sheers for your large windows or glass sliding doors. This unique vertical treatment resembles traditional sheer draperies but allows you to rotate the vertical fabric vanes like a traditional vertical blind. The Luminette vanes rotate to provide 180° of light control and are available in both translucent and room-darkening fabrics. With their on-trend fabric options, the sheers will help protect your home furnishings from damaging UV rays while allowing the view to the outside. Plus, you can coordinate fabrics with other Hunter Douglas window treatments to achieve an integrated look throughout the home. Silhouette® window shadings, introduced in 1991, feature adjustable fabric vanes suspended between two sheer facing fabrics, for excellent control of privacy, glare, and daylight. In addition to being Greenguard Gold Certified, Silhouette shades provide up to 88% ultraviolet protection when the vanes are open and 99% protection when the vanes are closed. The newest addition, Silhouette ClearView™ Shadings, will maximize your view with a unique combination of front and back sheers for greater view-through.